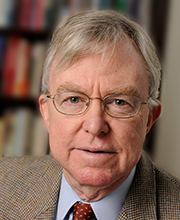 Dr. Robert Moffitt is the Krieger-Eisenhower Professor of Economics at Johns Hopkins University, where he holds a joint appointment with the Johns Hopkins School of Public Health. He is a labor economist whose research has concerned the impact of public programs on the work effort, labor supply, and incomes of recipients, the reasons for the decline in labor force participation in the U.S., volatility and turnover in the American labor market, and trends in earnings inequality. He is a Fellow of the Econometric Society, a Fellow of the Society of Labor Economists, a National Associate of the National Academy of Sciences, a recipient of a MERIT Award from the National Institutes of Health, a recipient of a Guggenheim Fellowship, a Fellow of the American Academy of Arts and Sciences, and Past President of the Population Association of America. He served as Chief Editor of the American Economic Review, the official journal of the American Economics Association.